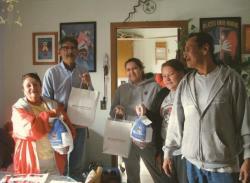 National Relief Charities and FACE Adult Education Students worked diligently the week of November 18th to provide Pass Creek Elderly’s (62+) with turkeys and thanksgiving meal fixings. The adult education students; Mario and Ruby Standing Bear, Marla Flood, Jordie DuBray, Francinity Big Crow, Kim Bettelyoun, Elizabeth Bettelyoun, and Emery Red Feather went out in suv’s and the shuttle with the help of Lester DuBray’s transportation staff. National Relief Charities has also provided American Horse School with turkeys, cranberries, and mashed potatoes for the community dinner held on November 26th at 12:30 pm. Many community members came into enjoyed this meal. We are also awaiting the Christmas Stockings that will be delivered soon. FACE Adults and other individuals donated their time this fall in Rapid City to help put together items in age appropriate stockings. National Relief Charities is an awesome organization that provides our community and others with needed items throughout the year. Our literacy program is going strong; students are lined up each morning to turn in their literacy reports to be able to choose a prize. Smiles what a way to start the day!. 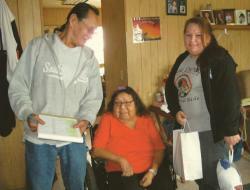 Copyright 2010-2013 Lakota Country Times. All rights reserved.